» Discovered: An previously unknown novel by PHILIP MacDONALD. Discovered: An previously unknown novel by PHILIP MacDONALD. 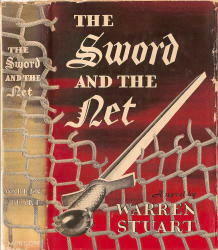 * The Sword and the Net (Morrow, 1941, hc) Joseph, 1942. There’s nothing remarkable about the entry. There are many, many authors with only a single title included in CFIV, about whom nothing is known, neither the author nor the book. Very occasionally a publisher presents a novel with a story so packed with exciting action and dramatic suspense that he hesitates to reveal any significant part of the plot for fear of spoiling the enjoyment of the reader. is just that kind of book � so thrilling and unexpected that we are deliberately withholding all description beyond the bare essentials. THE TIME of the story is 1940-41. Other Characters: Nazi officials and officers, Swedish peasants, secret agents; seamen; Americans of every type; Nazi saboteurs and spies. A spy story? Well, perhaps; but much more than that, for the author has blended a subtle development of character and the poignant love story of two people into a tale so packed with action that the pages almost turn themselves. Before getting to Al’s first-glance opinion of the book, I’ll point out the story also appeared in Two Complete Detective Books, Number 15 (Fall, 1942). The lead novel in that issue was Death Turns the Table, by John Dickson Carr, and of course I have a cover image to show you, one found on eBay at some time in the past. Truthfully, though, Al and I have been scooped on this rather unexpected find. In the latest issue of CADS, #52, which arrived just days ago, is a short announcement of the discovery by Tony Medawar, and more, a short synopsis and review of the book by that noted scholar of mystery fiction himself. “… a thriller rather than a detective story, and something of a Hitchcockian thriller at that. […] It is possible that the plot was first conceived for the cinema. As the news becomes more widely disseminated, the search is going to be much harder. A word to the wise may already be too late. PostScript: Tony also mentions in a footnote to his review something else I didn’t know. As “W. J. Stuart,” MacDonald did the novelization of the 1950s science fiction novel, Forbidden Planet (Farrar Straus & Cudahy, hc, 1956; Bantam A1443, pb, 1956). Also please note: The link to information for CADS is for issue #51,but #52 can be ordered from Geoff Bradley at the same address, but the price has gone up from $11 to $12. Tell him I sent you. >> Thanks, Jamie. In other words, the book seems to have gathered considerable notice when it first came out. I was wondering about that. It doesn’t seem likely that any of these reviewers or authors knew that the book was written by MacDonald, though, does it? If they had, I can’t imagine the secret could have been kept so long. 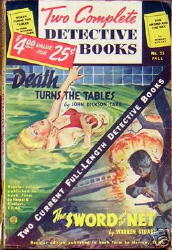 I have an original copy of the No.15 Fall edition “Two Complete Detective Books” Death Turns the Tables and The Sword and the Net. Is there a market for books like this? “Because of his German parentage, government agent Carl Steelman (George Sanders) is assigned to by his chief, Craig (Ward Bond), to join the Nazi Bund, to obtain information on the underground activities of the group. Steelman is welcomed and becomes a trusted member of the group. […] The government agents raid a Bund meeting and Steelman assumes the identity of one of the members who was about to depart to Germany for training. […] His training completed, Steelman is sent to America, via submarine, in charge of a group of eight saboteurs. 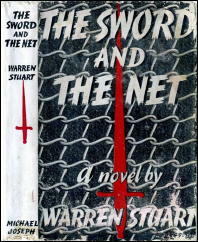 THE SWORD AND THE NET was published in 1941. You may want to know that the novel “Forbidden Planet” was also published in hardback in 1956 by Farrer, Straus and Cudahy of New York. Thanks, Randy. I hadn’t known about that edition before. I’ll revise the original post accordingly.